Cooking a meal at home using whole, fresh ingredients is almost always a healthy and satisfying choice, especially when that meal features plenty of vegetables. A key component of this healthy approach to feeding yourself and others is familiarity with the cooking times for your key ingredients. 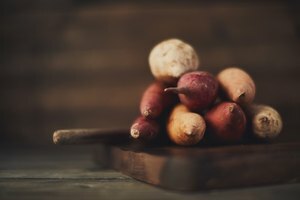 Knowing whether sweet potatoes cook faster than russets, or vice versa, lets you pick the best fit for your planned meal, making it easier to get dinner on the table before hunger overwhelms your best intentions. As a rule of thumb, russets take slightly longer to cook than sweet potatoes. But your cooking method makes a difference in cooking times – sometimes russets and sweet potatoes can cook in the same amount of time. Size also matters, because a large sweet potato may take more time to cook than a tiny russet. Using general time guidelines and testing for doneness with a knife give you the best indications of when either vegetable is fully cooked. Both russet potatoes and sweet potatoes take about an hour to bake in a 425-degree Fahrenheit oven. 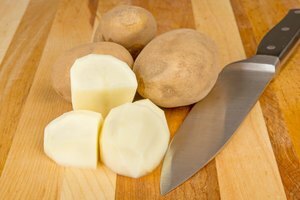 Bake either vegetable until a skewer or a sharp knife with a thin blade, such as a paring knife, slips easily all the way through – avoid the temptation to take either potato out of the oven until the flesh cooks completely and is soft and fluffy. Scrub both vegetables well before baking, and bake them without a foil wrapping, which steams rather than bakes them. 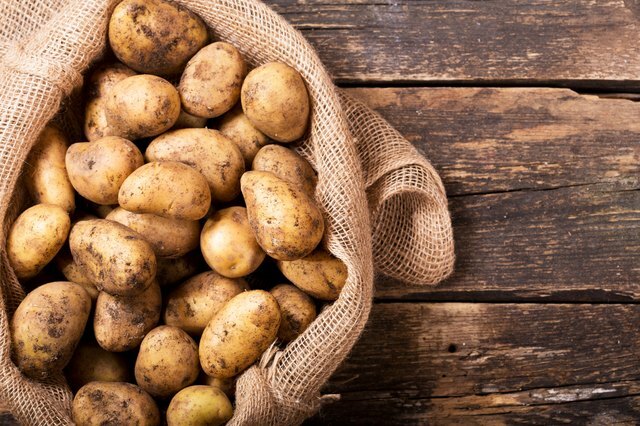 Because baking doesn't require any added fat, it's one of the healthiest ways to cook potatoes, provided of course that you don't load them up with lots of fatty toppings. Roasted wedges or fries of either russets or sweet potatoes give you a lower-fat alternative to their deep-fried relatives. 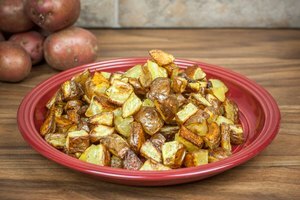 Cut in similarly sized pieces, tossed with oil, salt and pepper and roasted at 425 F, russets take about 40 minutes, while sweet potatoes cook in about 25 minutes. 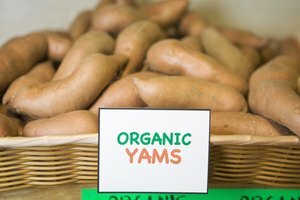 Because sweet potatoes have a much higher sugar content than russets, their surface caramelizes and browns much more quickly than russets – keep a close eye on them so they don't burn. Both russets and sweet potatoes cook in about 20 minutes when cut into small pieces and added to simmering soups or stews. Either vegetable will fall apart if they are overcooked. For mashing, either steam or boil the vegetables for 20 to 30 minutes, depending on whether you peel and cut the vegetables first or cook them whole, unpeeled – russets typically take about five to 10 minutes longer than sweet potatoes in any case. Try mashing either type of potato with Greek yogurt instead of butter for a lower-calories version with some added protein. You can microwave russets and sweet potatoes cut into chunks with a small amount of water for 10 to 12 minutes, depending on the size of the pieces. To cook the vegetables whole, microwave them on high power for six to eight minutes. As with other cooking methods, testing with a knife or skewer tells you whether the vegetables are completely cooked or whether they need another minute of cooking. This is another great fat-free cooking method, and one that saves you time without compromising on flavor or texture.